Our school’s mission states: St. Clare School is a Catholic, parish-school community rooted in Gospel values and dedicated to the spiritual and educational development of the whole child. It is with this hopeful, positive, and values-based approach, coupled with our academically-strong curriculum, that we have successfully nurtured and educated children every day for over 100 years, helping them to attain their true potential and become lifelong learners. We invite all families who want to learn about what makes St. Clare such a special place to come visit us during our annual Open House in January, call our school at 503-244-7600 to schedule a tour and appointment with our principal, and/or visit our Request for Information page and the school office will contact you. Learn more by downloading our St. Clare Snapshot. Attend our Open House in January or call the school at 503-244-7600 to schedule a tour and appointment with our principal. You can also visit our Request for Information page and the school office will contact you. Submit an online application via FACTs. Schedule a parent/principal meeting and a short assessment for your child that confirms he/she is ready for success in kindergarten. Await the school’s recommendation regarding your child’s acceptance, which will be given in a timely manner. Complete registration upon acceptance by finishing online enrollment and paying the enrollment fee. Have your child attend our Kindergarten Roundup in the spring. Learn more by downloading our Kindergarten Frequently Asked Questions. 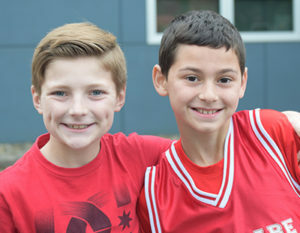 Call our school office at 503-244-7600 to inquire about availability or visit our Request for Information page and the school office will contact you. Schedule a tour and appointment with our principal. Schedule a one-day visit to St. Clare for your child(ren) in the grade in which they are currently enrolled (so your child can truly experience our community and determine if it will be a good fit for both the school and your family). Download our Frequently Asked Questions to learn more about our Elementary School and Middle School. New students are considered for admission into 8th grade on an exception basis, only. Learn more by downloading our Middle School Frequently Asked Questions. The principal and pastor make all final decisions pertaining to student admissions. Should you desire more information on our admissions process than what has been provided here, please click the button below and the school office will contact you.